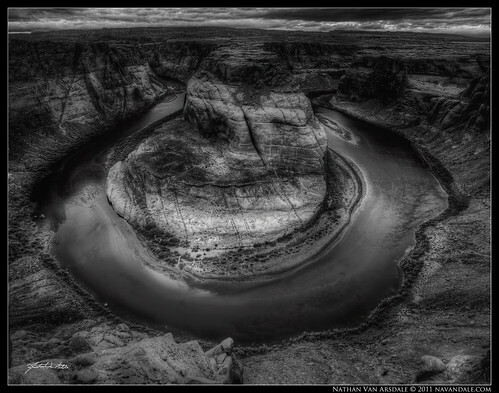 Horseshoe Bend, originally uploaded by navandale. Probably one of the most recognizable images from the American Southwest is Horseshoe Bend in Page, AZ. A short hike from the convenient parking lot, and hundreds of visitors a day enjoy a sudden geologic marvel. Although My 15mm fisheye was wide enough to fit the whole bend in the frame, I just wasn't happy with the composition. For such a straight-forward shooting location, I wanted to make an image that's a little more memorable. So, as is normally the case, I set my camera up to take auto-bracketed exposures that I would later merge into an HDR image (See the Video Tutorial). But I decided to turn my camera vertically, and take three frames of the bend, from left to right, overlapping by about 30% or so. After I processed each frame into an HDR image using Photomatix Pro , I merged the images using Photoshop 's "Photomerge" option, and selecting "Geometric Distortion Correction." After a couple of songs-worth of processing, the resulting panorama needed a little cropping. Once I had the composition cropped the way I wanted, I went about with my usual editing procedures using Camera RAW and Photoshop's Adjustment Layers. After getting the image where I wanted it as far as contrast, sharpness, and levels, I converted it to Greyscale, and then to a Pantone image under Image>Mode>Duotone to give it a richer black and white effect.